Outside Water Mains – Why do they always burst or leak at this time of year? Water mains or “Water Supply Pipes” as they are known to domestic dwellings can freeze in cold weather conditions if they are not at the correct depth underground or if they are not adequately insulated if they are on the external side of the building. 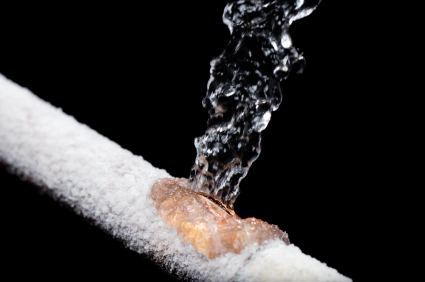 Whilst freezing the ice expands inside of the pipework and all the time it is frozen it doesn’t cause a problem until it melts and that is when the leaks appear. The expansion of the ice in the pipe is what causes the pipe to crack or split and this is the section that will either have to be renewed or sometimes it is more cost effective to actually renew the complete water main rather than trying to find the exact position of the leak if it is underground. Domestic water mains are now installed with 25mm Alkathene pipework which is flexible unlike the old barrel or steel or copper pipes which had no flexibility and this would take a certain amount of expansion when frozen. Also the replacement of this water main is not as intrusive as years gone by as they can now be ‘moled’ in from point A to point B without the need for excavating driveways or gardens. Homeowners obviously benefit from the fact that sometime there is residue in the water from the old steel pipes or if the water pipes are in lead there is evidence that this can cause lead poisoning. By having the pipework renewed in alkathene this removes all these risk factors as well as probably increasing the flow rate considerably of your water supply to taps as the bore of the pipework is enlarged and clean. Have you got a problem with a burst water main? Contact Blockbusters now about our water mains repair service.